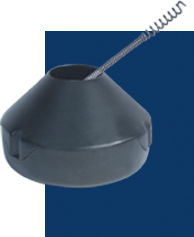 With a quick movement of the Grip Shield, you release or engage the cable – without the need for a chuck, and with automatic adjustment for different cable diameters. As a result, you get your cable into the line faster, pull it out faster, and have full control at all times. Because the Slide Action Chuck is linked to the Grip Shield, handling is easy and comfortable. 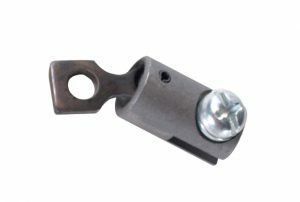 Slide Grip Shield FORWARD to release cable. Pull Cable out of drum. Slide Grip Shield BACK to grip cable. Run cable into line and repeat. It’s that quick! To switch to a different diameter cable (or even connect two 3/8″ cables together), you just loosen three screws, pull the front of the drum off the cable, and load another cartridge. Changing takes less than a minute and turns what could be a messy job into a clean one. The tough plastic cartridges are so inexpensive, you’ll probably want to store all of your cables in them. All-purpose Down Head Fitting (Catalog #DHF) can be used with all standard HECS cutters. 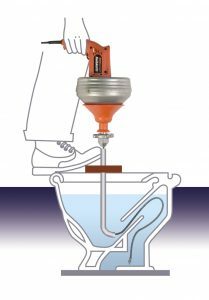 Closet Auger Attachment (Catalog #CAA) Guides 1/4″ or 5/16″cable into bowl. Carrying Case (Catalog #MCC) For Super-Vee, Power-Vee and Handylectric. 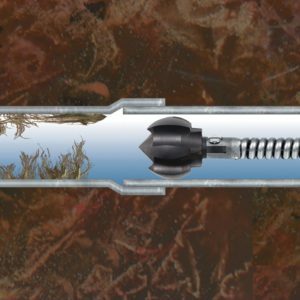 Click here to go to the ClogChopper page. 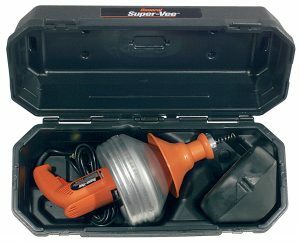 Super-Vee with carrying case, 25HE1 (25 ft. x 1/4″), 25HE2 (25 ft. x 3/8″) cables, HECS cutter set and cartridges. Super-Vee with carrying case, 25HE1 (25 ft. x 1/4″), 35HE2 (35 ft. x 3/8″) cables, HECS cutter set and cartridges. Super-Vee with carrying case, 50HE1 (50 ft. x 1/4″), 35HE2 (35 ft. x 3/8″) cables, HECS cutter set and cartridges. Super-Vee with 25HE1-A (25 ft. x 5/16″) cable. Super-Vee with carrying case and 25HE1-A (25 ft. x 5/16″) cable. Super-Vee with 25HE1 (25 ft. x 1/4″) cable. Super-Vee with carrying case and 25HE1 (25 ft. x 1/4″) cable. Grip shield moves back to engage cable, forward to release it. Automatically adjusts for different diameter cables.